Casa Grande Hotel Resort & Spa – The perfect weekend escape from São Paulo! On weekends, residents of São Paulo flee the constraints of the city, and business travelers not wanting to be left behind also usually leave and return on Monday to work. However, the question always remains as to where to go for the weekend. The Casa Grande Hotel Resort & Spa, www.casagrandehotel.com.br, in Guarujá offers the perfect get-away solution. 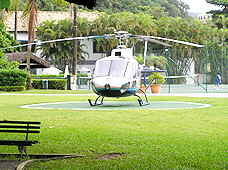 This gorgeous 268-room resort is a 45-minute drive from the city, or if you are in a hurry to start your vacation, there is helicopter service from the airport which takes just 28 minutes, or 15-minutes from Avenida Paulista in São Paulo to the hotel’s own heliport. In January 2005, Edward F. Nesta and I returned to this fabulous hotel, since we too, were in São Paulo, and wanted to take a few days off. Casa Grande Hotel Resort & Spa really has something to offer everyone. If you like to surf or walk along the beach, Praia da Enseada is located across the street from the hotel. Swimming in a pool more your style? The hotel has a large outdoor pool surrounded by exotic flowers and tall coconut trees, and has views of the ocean. Fitness enthusiasts will appreciate the instructor-led pool exercise, as well as the state-of-the-art Fitness Academy that has glass walls, allowing guests to exercise with ocean views, as well as a Personal Trainer to guide you through your exercise program. Professional tennis courts beckon, as well as a lighted soccer field, and volleyball court. Golfers can take advantage of discount guest privileges at a 9-hole golf course just 5 kilometers away. Brazilian summers can often be rainy, which is not a problem, their Home Theater shows complimentary movies 3 times per day. 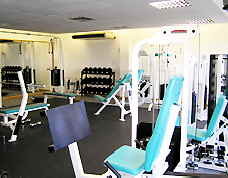 Each day there is a complete list of daily indoor or outdoor activities, depending on the weather. Traveling with children? The hotel has a children’s playhouse, which offers a full program of activities. Love to shop? 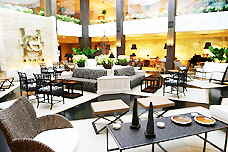 You can purchase antiques, take home a Brazilian gemstone, (or two), or resort clothing from the hotel’s lobby shops. During the summer, they also have a shopping complex located across the entranceway, where guests can load up on the latest in Brazilian fashions. Want to keep up with your email but forgot your laptop? No problem, there is a Business Center. In the evenings, there are Art Auctions, as well as live music in their Lobby Bar, which begins in the afternoon and continues into the evening, as well as in Piano Bar and their nightclub. Guests looking to pamper themselves or lose weight may do so at SpaMed Guarujá, their complete Spa, with its own excellent restaurant, Spa Diet. (Read about SpaMed Guarujá in our SPA section). Gourmands will appreciate the excellent restaurants, including Chiabatta, (read about our incredible lunch in the Restaurants section), and Thai, (read about our sensational dinner in Restaurants and Chefs' Recipes where the Chef shares one of my favorite recipes). From their sumptuous breakfast buffet, to snacks by the pool, guests can satisfy their every craving. Our large room had a king bed that was elegantly dressed in a white matelassé coverlet and café au lait colored bed skirt. There were 2 white leather chairs, the desk had postcards for guests to send to envious friends, a drop-leaf table, gleaming Brazilian wood floors, a wooden ceiling painted white, and black and white photographs graced the walls. The large closets held a safe, as well as fluffy robes and instead of the usual slippers one finds at luxury hotels, the hotel has their own white havaianas, (the famous Brazilian rubber sandals), which were perfect for using at the pool, walking the beach or at SpaMed. There was a large Philips television, Philips DVD player, and a Philips Alarm Clock/Radio. There was also a bar area with a mini-bar. 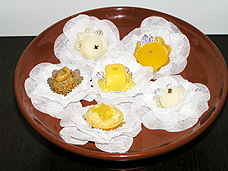 We were pampered royally with a pedestal bowl filled with tempting assorted Brazilian sweets, including Quindim. Naturally, we ate them all, and were rewarded with another bowl of sweets the next day! See, sometimes it pays to eat your desserts! The hotel had also thoughtfully placed a large bowl of exotic fruit next to the sweets, which provided us with a choice; guilty pleasures or healthy ones, we compromised and ate both! The large marble bathroom featured a deep soaking tub set in beige marble, as well as a walk-in shower large enough for a romantic shower for two. Two white porcelain bowl sinks sat on a marble base, and there was a hairdryer, make-up mirror, as well as a vast variety of branded amenities. 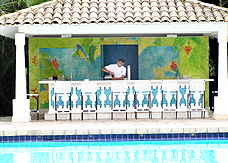 Each day we started with the breakfast buffet, where guests can select from exotic fruits, juices, yogurt, and cereal, or feast on eggs, bacon, sausages, meats, cheeses, freshly baked breads, including the famous hot pão de queijo, (miniature cheese rolls), as well as savory or sweet rolls, and many types of cakes. We would savor our breakfast and coffee on the verandah of the restaurant with the sounds and vista of the sea. From our birds-eye-view, we also had a spectacular view of the many pretty birds, including the Bem-te-ve, a brightly colored yellow and black bird. Afterwards, we had to make a difficult choice as what we wanted to do next, which is a very nice dilemma indeed. 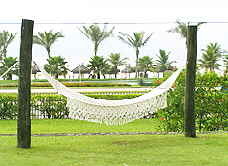 Of course, sometimes the white-fringed hammocks provided the perfect place to relax and then decide what to do next. No rush, this is Brazil where there is time for everything! Please read our other articles on Brazil in Destination, Hotels & Resorts, Restaurants, Gastronomy, Chefs's Recipes, Spas and Music Scene. You may also enjoy our article the “Best of São Paulo” in Destinations.